We will release a new t-shirt at the Zenyatta Shop this December, and it could be your design! If you’d like to see fellow Zenyatta fans wearing your tribute to The Queen, just submit your artwork of any kind to fans@zenyatta.com. Designs must fit within an 8”x12” space. Entries must be submitted in .jpg, .png, .pdf, .psd, .ai, or .eps format. You must include your full name, mailing address, and email address with your entry in order to be eligible to enter to win. We will consider designs related to Zenyatta and/or any of her offspring. Submissions can be realistic or abstract. Creativity is encouraged! We’ll choose a group of finalists from all eligible entries, and you’ll be able to vote for the winner during the Zenyatta Celebration. 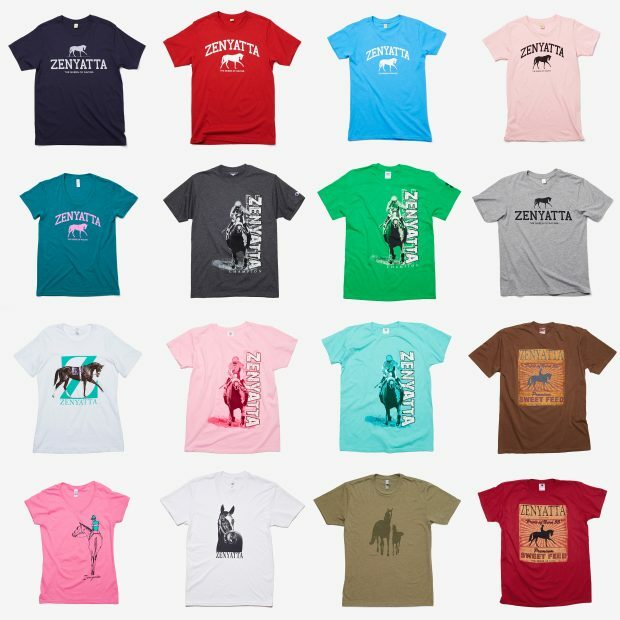 The winner of the contest will receive a $150 Zenyatta Shop gift certificate plus six t-shirts featuring their design. Tip: Use https://wetransfer.com to send files that are too large to email. If you have questions about digitizing art or submitting an existing drawing or painting, you can email fans@zenyatta.com. The contest ends on October 31, 2018 at 11:59 P.M. Pacific Time. Read the complete Design our 2018 T-Shirt Contest Rules, Terms & Conditions here. A great article about Winx.I,for one,will be sad when she finally retires.We need champions like her.Just amazing! I loved that article and could watch that race over and over! She is amazing. Thanks for sharing the link. Yay Winx! Ya done good! thank you for the video Sheena is so nice to see her. Judy indeed she was a beauty and me too i cry when I see her. Sometimes life can be is so cruel…. Love you, big hugs Ingrid. Wow. I don’t remember if I had seen that video before or not, but it definitely makes my eyes leak. What a beautiful filly. These remarkable, magnificent, majestic and strong creatures are so fragile and delicate. Oh, she was a beauty.!!! Now I am crying too. LIttle Curly Mane grew into such a strong girl who had personality galore. Zenny was such a good mom and the shots of the two of them are so precious. Her blaze reminds me of Ziconic, hope he is doing well. Happy for Coz to have such a good life in his second career with Isabella! Congratulations Coz on your performance recently, well done. I see you like company like your momma and loved the shot of you with the children. Winx relaxing after her historical victory. OMG, look at that beautiful eye on Winx; she looks like she’s smiling. What a gorgeous girl. Thanks so much for the news on ZI. Goodnight. Love and Hugs, JB, LM and all the Sweeties. This is an awesome photo! Those eyes!! Oh Winx, you are so wonderful. Too Cute. News of Ziconic.He will hopefully be back at Del Mar. Sheena, where did you hear the news?? Someone visited John over the weekend.He was thrilled with Coz too. Thanks for the news Sheena, I was unable to visit John due to family issues. Roaring Lion looks great and seems to be feeling frisky. Best of luck to him, Mendelssohn and Thunder Snow — safe racing always. Safe and sound racing to all horses and riders. Godspeed. I received an email today from Neigh Savers. Karin reported sad news about CowtownMary (Wilson). Anne Wilson and everyone involved were so glad that he had been retired from the track in sound condition; however, this turned out to be far from true. Wilson became lame and after a tough road to diagnosis, it was found that his stifle joint had deteriorated so badly that it couldn’t be fixed. Steroid injections from a young age and for racing had masked problems which might have been addressed and corrected much earlier. Poor Wilson was in pain from arthritis and from this damaged joint so the only merciful treatment was euthanasia. The seriousness of his condition became apparent as the effects of steroids wore off. The stifle would collapse causing awful pain at the end. Wilson had a couple of months of happy days, and his last day was filled with love, kindness and lots of extra attention. Karin included a nice photo of this sweet boy which was taken on his last day. Go to the Neigh Savers website to read about this. Condolences to all who loved him as well (especially Anne W.). Long time visitors to this site will remember Anne and Rod Wilson and Cowtownmary. Go to the Neigh Savers website (www.neighsavers.org) for this very sad news. RIP beautiful Cowtownmary, aka Wilson. I am so sorry we lost you. Sorry, I got this news in an email, but it isn’t posted on their website yet. I don’t know how to post my email message on the blog at this time. However, if anyone wishes, donations would be appreciated in memory of this brave horse. You can donate on the Neigh Savers site that I posted above. Awwwww; please send condolences to all the members who loved Wilson. RIP Wilson. Thank you for sharing this sad sad news. So heartbreaking. Many of us have followed Cowtown Mary and Anne’s stories about him for awhile. So sad. RIP Cowtown/Wilson. You were loved and will be missed dearly. Hi. I did not get my tv schedule for this week. We are in the Mountain Time zone. What is the start time for the Breeders Cup broadcast? Thanks. Thanks for the schedule, Judy! This is very helpful. Looking forward to exciting (but safe) racing on both days. Love Glen’s pic on his twitter page. Those hoof slippers are great. Did she ever find some “blue” grass? Oh the Breeders Cup!! Such an exciting two days of racing. I lovingly remember watching our Z run her last race in the Breeders Cup Classic, sitting on bleacher seats, but it did not matter, I loved her. I can replay the race in my head even today and Z was the most remarkable Queen of racing as she missed the win by less than a head. For her to have run and passed awesome top male horses coming so far from behind, in my heart she was a true winner. I have no favorite as Justify is out of the picture. I just wish all horses and jockeys a safe journey and a memorable ride. Guess what? The TV Weekly showed up with my paper today. Woo hoo!